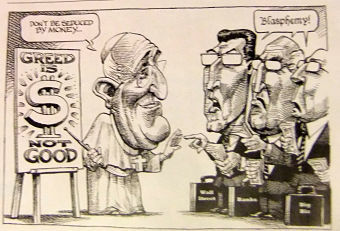 Vatican blasts inequality & greed for undermining human prospects. Poverty: a main driver of vulnerability. UN ISDR. flickr cc. The Vatican has launched a stringent critique of widespread abuses in global economies, which are driving astonishing degrees of inequality, threatening ecological sustainability, and unleashing powerful reactionary political forces in response, as seen in parts of Europe and elsewhere. The issues are keenly pertinent in Australia, as we see in the Australian Royal Commission into banking and financial services. Even in our hallowed financial institutions, there has been a corrosion of ethical practice and a culture of greed, resulting at times in outright fraud and corruption. The title of the Vatican document Oeconomicae et pecuniariae questiones can be translated as On Economic and Financial Matters. It was written not by Pope Francis, but by the newly formed Dicastery for Promoting Integral Human Development, together with the Congregation of the Doctrine of the Faith. Approved by Pope Francis on 6 January, it was not released until 17 May 2018 in Spanish and Italian, with a very rough English translation rushed out at the last minute. It reiterates the call by Pope Francis in Laudato Si’ for an urgent dialogue between politics and economics in favour of human life and wellbeing. “Money must serve, not rule!” (#6). Oeconomicae is directed primarily to the world of business and economics, though the English translation lacks the popular punch and directness of Francis’s writings. The 10,000-word document encapsulates the strong critiques of forms of economics that are most responsible for many social and economic crises, drawing strongly from the documents of Pope Francis, but also from his recent predecessors and back over 125 years to Leo XIII. It is also informed by the thinking of many leading scientists and economists who have been advising the Vatican agencies, warning how urgent is the need to reduce extreme inequalities and address climate issues before they become truly catastrophic. The critique in Oeconomicae centres on the growing influence of financial markets and the economic thinking which exaggerated the role of free markets, believing that markets of themselves, without adequate regulation, would produce the most efficient results, ignoring concerns about liberty, social equity, and human wellbeing. 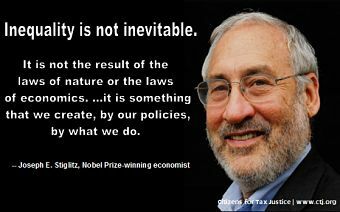 Joesph Stiglitz on Inequality. citizens4taxjustice. flickr cc. “At stake is the authentic well-being of a majority of men and women of our planet who are at risk of being ‘excluded and marginalized’”, while a rich minority, “indifferent to the condition of the majority, exploits and reserves for itself substantial resources and wealth”. The document does not attempt to adjudicate between rival economic theories, and does not even use the term neoliberalism, although it is clearly implied, but insists that economics must not abandon the profoundly moral task of promoting the wellbeing of everyone as fully as possible, but especially of those most in need. The writers are acutely aware of the havoc economic crises are causing with very high unemployment, not least in much of Europe. It is not just the young who are disillusioned with democracy, as well as with social and financial institutions. The Vatican document recognises the great power of markets in coordinating production and delivering an abundance of goods to serve human needs, but argues markets are not able to govern themselves. They need non-market social forces to protect the environment, ensure real equity in bargaining, protect against fraud and oppression, eradicate poverty and inequality, and provide security in society. 2013_12_190004 (t2) – Pope Francis. Gwydion M Williams. flickr cc. Without specifically mentioning the 1933 Glass-Steagall Act used by the US to separate savings banks from investment banks, the document calls for a clear separation of investment banking from that of “mere business”, in order to increase financial stability. In Australia, we have seen that seeking profit at any cost has indeed become commonplace, not just in finance, but also across whole sectors of business, including the underpayment of workers in fast food and petrol franchises, as well as in sectors of hospitality, and also of seasonal and other workers in agriculture. As the Vatican document comments, “the objective of mere profit easily creates a perverse and selective logic that often favours the advancement of business leaders who are capable, but greedy and unscrupulous”. Oeconomicae highlights the manipulation of markets, as in the subprime mortgages that helped precipitate the recent financial crises, along with problems with rating agencies and inter-bank lending arrangements which can create a “dangerous oligopoly” over credit markets (#25). The securitisation of derivatives fraudulently disguised economic risks, and contributed to the speculative bubbles leading up to the financial crisis. Such products, including the “economic cannibalism” in credit default swaps (CDS), became “a ticking time bomb ready sooner or later to explode”. “The fact that this could have happened with impunity for many years shows how fragile and exposed to fraud is a financial system not sufficiently controlled by regulations, and lacking proportionate sanctions for the violations … which its stakeholders often encounter” (#27). The authors of Oeconomicae also deplore the growth of the so-called shadow banking system, resulting in a loss of control by national authorities. Despite its legitimate roles, offshore finance thrives through mechanisms of tax avoidance and money laundering from international crime networks. “Today, more than half of the commercial world is orchestrated by noteworthy persons who cut down their tax burden by transferring the profits into fiscal havens, and the costs into the countries of higher taxation.” Often, the money in these offshore sites is from criminal activities (#30). There has also been an “enormous outflow of capital” from many low-income countries, causing great damage to these countries. The document attacks the “hypocrisy” of states which profit from such operations. To help control these capital flows, Oeconomicae supports calls for “a minimum tax” on offshore transactions. It also calls for transparency and public accountability in multinational companies, so that they pay appropriate taxes in the countries in which they operate (#31). The document notes that “the accumulated private wealth of some elites in fiscal havens is almost equal to the public debt of the respective countries”. 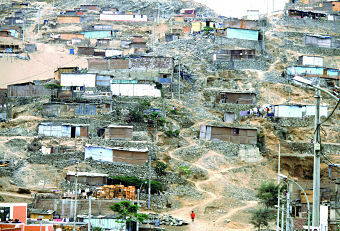 Such countries are left to carry the burden of the debt, which falls on millions of very poor people (#32). The authors urge consumers to “vote with your wallet”, choosing goods that are ethically responsible, without exploitation in supply chains, or damaging the environment. Though as an individual, the gesture might seem “banal”, when many others also embrace ethical choices, this influences demand, and businesses will respond. “Today, as never before, we are all called, as sentinels, to watch over genuine life, and to make ourselves catalysts of a new social behavior” for the good of all and for the planet (#34). Oeconomicae et pecuniariae questiones reiterates the focus of Pope Francis on issues of global poverty and inequality, now exacerbated by global warming and environmental issues. He considers these of overriding moral urgency in the face of looming catastrophic threats to whole populations, and indeed to entire planetary life support systems. He does not see the prospects as hopeless, but insists that we must take immediate action as individuals, as well as collectively. Whether we like it or not, we are all in this together, and never has this call to protect the common good been so dramatic and immediate. This is a long version of the article in Eureka Street on 30 June 2018.